Different Types of Valves include Gate, Globe, Ball, Butterfly, Diaphragm, Ball, Check, Plug, Safety, Relief vales. Gate valves are generally used in systems where low flow resistance for a fully open valve is desired and there is no need to throttle the flow. Ball valves allow quick, quarter turn on-off operation and have poor throttling characteristics. Plug valves are often used to direct flow between several different ports through use of a single valve. Diaphragm valves and pinch valves are used in systems where it is desirable for the entire operating mechanism to be completely isolated from the fluid. Butterfly valves provide significant advantages over other valve designs in weight, space, and cost for large valve applications. Check valves automatically open to allow flow in one direction and seat to prevent flow in the reverse direction. A stop check valve is a combination of a lift check valve and a globe valve and incorporates the characteristics of both. Safety/relief valves are used to provide automatic over-pressurization protection for a system. [Check valve] or non-return valve, allows the fluid to pass in one direction only. [Pressure Reducing Valve], to regulate the pressure of the fluid. [Thermal expansion valve], used in refrigeration and air conditioning systems. Ball valve is a quarter turn operated valve. The closure member is a spherical plug with a through hole. When the valve is in open state, the through hole is in-line with the fluid flow and hence, the fluid passes through it. The valve is closed by rotating the globe by 90 Deg. such that the hole now becomes perpendicular to the flow and hence, stops the flow. The seat is usually circumferential, made up of soft materials to offer a tight shutoff. The seat can be made either out of plastic or metals. Ball valves are not recommended to be used in a partially open condition. Due to misalignment between the flow direction and opening of the plug, large pressure drop takes place in partially open condition. Due to above specified challenges, ball valves are mostly used in shutoff applications. Ball valves are commonly used in steam, water, oil, gas, air, corrosive fluids. They can handle slurries and dusty dry fluids. Ball valves are not used with abrasive and fibrous materials as it poses risk of damage to the seat and plug surface. Gate valve is a sliding type of valve. In gate valves, the closing member is a metal gate. The gate slides down to close the valve. In fully open conditions, the flow area is equal to the area of the pipe and hence, there is negligible pressure drop across the valve. Gate valve should ideally be used as on-off valve. It is not advisable to use them as throttling valves because in partly open conditions, erosion of gate might take place. In partially open conditions, due to vibrations, valve is exposed to quick wear and tear. Also, during closing and opening, there is considerable amount of friction and hence, opening and closing these vales quickly and frequently is not possible. These valves find their use in petrochemical industry due to the fact that they can work with metal-metal sealing. Similar to ball valves, plug valves are also quarter turn type of valves. This valve consists of a plug which can be either cylindrical or conical in shape. The plug has a through slit which remains in-line with the flow in the open condition. When the plug is turned by 90 Deg., this slit becomes perpendicular to flow and the valve gets closed. Plug valves are well suited to handle fluids with suspended solids, slurries etc. Plug valves are primarily used for on-off applications. When used for throttling purpose, the pressure drop through the valve is higher because of misalignment between flow direction and the direction of the opening (slit). Butterfly valves are most simple yet versatile valves. They are quarter turn operated valves which are commonly used in multiple industries for varied applications. Quarter turn operation ensures quick operating of the valve. In the open condition there is minimum obstruction to the fluid flow through the valve as the flow passes around the disc aerodynamically. This results in very less pressure drop through the valve. Due to its unique mode of operation, the valve can be actuated easily without requiring high torques and wear and tear. Due to lack of friction, use of bulky actuators can be avoided. Another advantage offered by butterfly valve is their compact size. The valve is quite compact, resembling a metal disc. This makes their installation very easy. They can be used to handle slurries and fluids with suspended solids as there are no cavities for deposition of solid particles inside the valve body. Globe valve is a linear motion type of valves and is typically used in both on-off and throttling applications. In globe valves, the flow of the fluid through valve follows an S-path. Due to this, the flow direction changes twice which results in higher pressure drops. Due to other advantages offered by them, they are widely used in applications where pressure drop through the valve is not a controlling factor. These valves are generally not used beyond sizes larger than NPS 12 (DN 300) as enormous forces are exerted on the stem to open or close the valve under fluid pressures. Globe valves require high pressures on the seat to keep it closed when the fluid exerts pressure from the bottom of the disc. 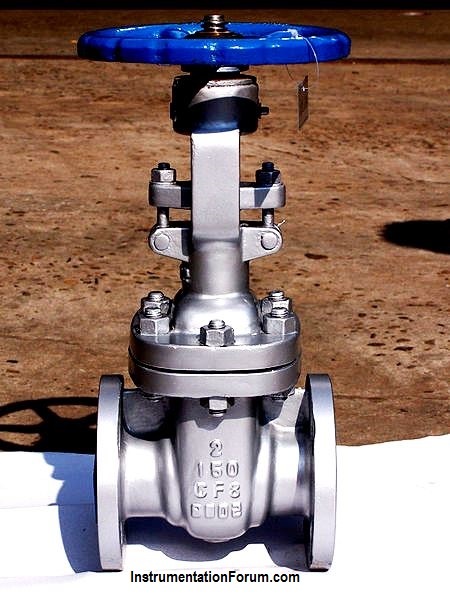 When the disc is removed from the stem and allowed to rest on its own weight, globe valves can be used as non-return valves. Machining of seats is easier and cheaper compared to other types of valves. Pinch valves consist of a plastic tube/sleeve which is made up of reinforced elastomers. The sealing/ closing action is achieved by throttling or pinching this sleeve/tube. Pinch valves are best suited for handling slurries and fluids having suspended solids. Pinch valves offer many benefits over the other types of valves. They can be used for handling corrosive fluids as there is no contact between the fluid carried and the actual valve mechanism. Once suitable sleeve material is selected, this valve can work with a variety of fluids. As fluid being carried does not come in contact with the metal parts, these valves can be used for food grade applications also. Generally, pinch valves are suitable for low pressure applications. When used with abrasive slurries, they should be used as on-off valves; if used for throttling purposes, the sleeve will get worn out. Disc check valves, also called as non-return valves allow the flow to pass through them in only one direction and stop the flow in reverse direction. Because of this unique directional property, disc check valves are essentially used for some critical applications in the steam systems. 1. Lift Check Valve- Lift check valves work simply on the principle of gravity. When the fluid comes in the forward direction, the disc gets lifted from the seat against the gravitational force by the force of incoming fluid. The valve thus allows fluid to pass in this direction. When the fluid comes in opposite direction, it supports the force of gravity and the disc remains on the seat, keeping the valve closed. Tight shutoff can be difficult to achieve in case back pressures are low. The valve will leak the fluid in such situations. 2. Swing Check Valve- In this kind of check valve, the disc or the closing element swings around a point to which it is hinged. When the fluid comes in the forward direction, the disc swings in an open position allowing the fluid to pass. When the fluid flow comes in the opposite direction, the disc swings and rests on the seat to lose it. 3. Spring loaded Check Valves- In this kind of check valves, tight shut-off it provided using a spring. The spring holds back the disc on the seat. Even in the forward flow condition, the fluid should exert some pressure, called cracking pressure in order to open the disc against the spring pressure. 4. Diaphragm Type Check Valve- This kind of check valves uses diaphragms arranged in such a way that that open to allow the flow only in forward direction. When flow comes from the reverse direction, the diaphragms remain closed. 1. After a float trap- Steam traps are passive device and work on the principle of the pressure difference. During operation, process pressure might go under the backpressure after trap. In such situations, because of the negative pressure across trap, condensate might go back into the process equipment through the trap. Hence, it is always advisable to fix a disc check or non-return valve after the float trap. This check valve will allow the condensate to flow from the trap outlet to the condensate recovery system but will ensure that it does not flow in reverse direction. 2. Mixing applications- Applications where two or more fluid are mixed, check valves should be installed at the end of each individual line. This avoids the contamination of one fluid by the other. Under normal operating conditions, the valve will remain closed not allowing the steam to pass through it. When the vacuum formation takes place (during shutoff) the disc will open and will allow the air to come in thus avoiding the formation of vacuum.